There is probably no way to generalize on the installation process for FTTx since every system is unique and, in some cases, every subscriber is different. Rather than telling you how to install FTTx here, we will try to illustrate some of the ways that others have installed their systems and offer advice on how to design and install systems most efficiently. This drawing shows the location of the hardware used in creating a typical PON network. 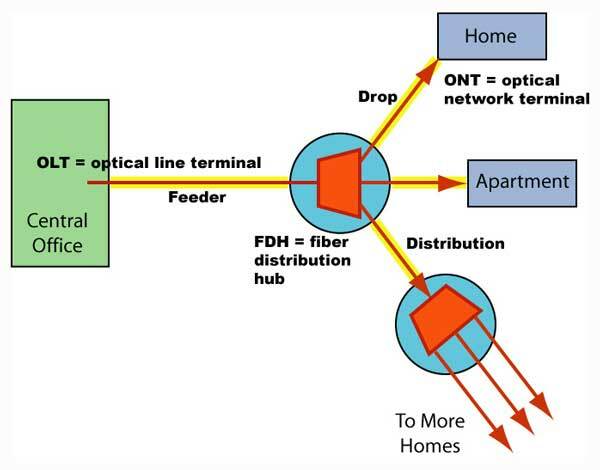 This drawing also defines the network jargon for cables: a "feeder" cable extends from the OLT (optical line terminal) in the CO (central office) to a FDH (fiber distribution hub) where the PON (passive optical network) splitter is housed. It then connects to "distribution" cables that go out toward the subscriber location where "drop" cables will be used to connect the final link to the ONT (optical network terminal). Perhaps we should start with some history. When FTTH using PONs first began being installed, it was considered a extension of regular telecom systems, where subscribers were being connected to a metropolitan system. Cabinets or pedestals containing the PON couplers were placed near a group of subscribers. Cables were pulled between the cabinet and the central office containing the PON system electronics and spliced on each end by the usual OSP installation crews and were tested as normally done. 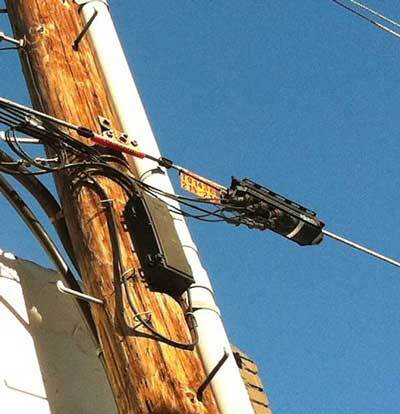 On the subscriber end, drop cables were placed to the home and connected either by splicing or installing connectors (APC to prevent reflectance problems). 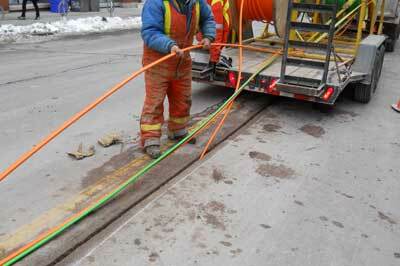 Drop cables could be installed aerially, underground or buried. Installing the cables through customer's yards created a problem as it is time consuming and disruptive to the customer. Simple trenching was sometimes dropped in favor of directional boring, an expensive process. Connectors were installed either by fusion splicing on pigtails or using prepolished splice connectors. 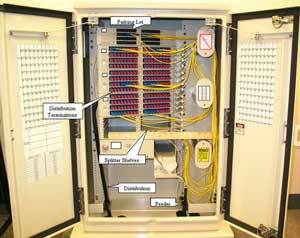 After the cable plant was installed, the optical network terminal (ONT) was installed at the home. Some systems installed ONTs on the outside of the house, some inside garages, some inside the home. Some homebuilders built new homes with provision for the ONT inside the home and installed cabling and power to the same area to create a home prepared for broadband. See the examples below. After the ONT was installed and tested, it was necessary to complete the installation by connecting the customers phones, TVs and computers. In all, three or four groups of installers were needed to install a FTTH customer. After some experience with the systems, methods were tried to simplify the process and cut costs. A big breakthrough came with the development of prefabricated cabling systems (sometimes call pre-terminated cabling) that eliminated the need for most of the splicing. Cables with weatherproof connectors were purchased made to the lengths needed and pedestals were factory made with connectors for the drop to the home and a cable ready to splice onto the cable installed from the central office. The prefab drop cables could be run aerially, even lashed to current telephone wires. They were also small enough they could be pulled through small PVC conduit often installed to home in new construction. Most of the systems use multi-connector cables near the homes being connected so homes can be connected during the first install or later when more customers decide to take the service. 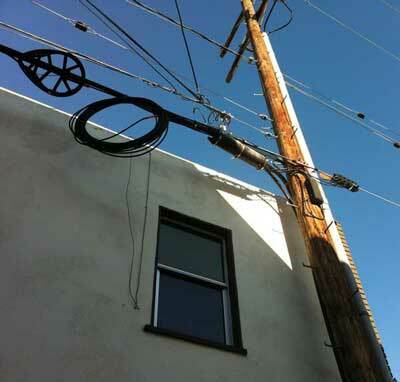 Aerial installation in Santa Monica, CA, using prefab cabling system. Closeup of the six-port drop. If the cable is underground, it will usually be pulled through conduit from connection to the distribution cable or the splitter to the home. Here a preterminated systems has two home drops connected to the distribution cable. Underground installation of prefab cable system in Long Beach, CA. Other systems used microduct installation which requires little or no digging to install underground or under a road. 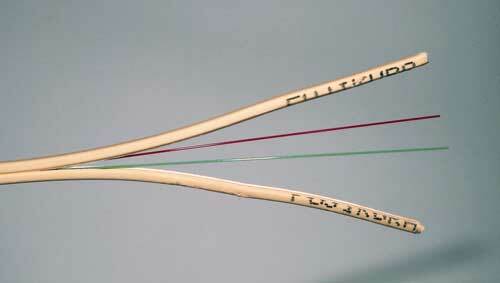 Microducts can accommodate small regular cables or use air-blown fibers, another technique used in some systems. Microduct installation using a saw on a paved street. The splitter can be housed in a central office or a pedestal in the neighborhood near the homes served. 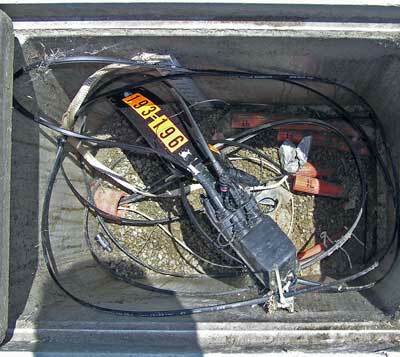 Here is a typical pedestal that has connections to the CO, splitters and fibers out to each home in a sealed enclosure. The advantage of PONs is that this pedestal is passive - it does not require any power as would a switch or node for fiber to the curb. A network interface device containing fiber optic transmitters and receivers will be installed at the house. Some are installed on the outside of the house, others are indoors. Some houses are now being built with cabinets in the house for connecting to the FTTH fiber and then distributing phone, TV and Internet connections throughout the house over state of the art cabling. The incoming cable needs to be terminated at the house, tested, connected to the interface and the service tested. Several new cable types were developed for use in FTTH. Until FTTH, most single fiber cables were complicated structures with tight buffered fibers and aramid fiber strength members inside plastic jackets, usually 3mm in diameter or sometimes smaller. While these cables were adequate for factory termination into prefabricated assemblies, they were not ideal for field termination or use inside buildings. With the advent of bend-insensitive fibers that required less protection, a new type of drop cable was developed that molded a bend-insensitive fiber inside a small plastic structure surrounded by metal or aramid fiber strength members. This design could also be made as a "figure 8" cable with a messenger for support in aerial installation. Here are some photos of this type of cable. To work with these cables, special fiber closures were developed that are more convenient for field installation. This closure has entries for distribution cables, including one coming in and one continuing on to another closure for daisy-chained cables. There are multiple outputs for drop cables which are terminated in connectors. 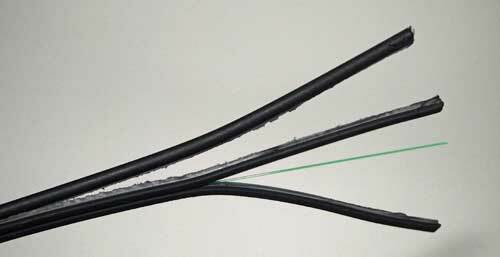 Some closures like this one have provision for splicing on pigtails to terminate the distribution cables while others are designed for direct termination using prepolished-splice connectors. Patching with connectors in a re-enterable closure allows adding new drops when needed. 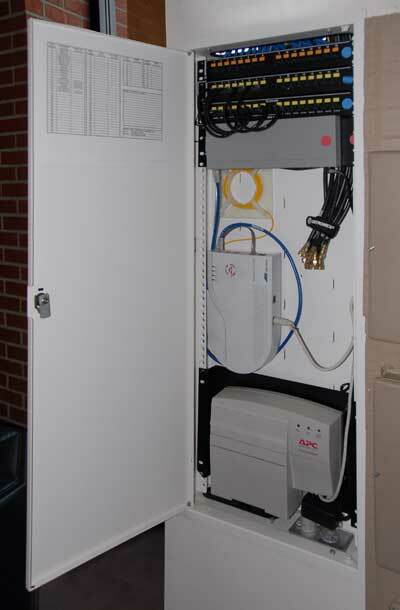 Multi-dwelling units (MDUs in some suppliers jargon) are sometimes handled like FTTC, where fiber is brought into the building and individual units are connected over copper cables, but they are ideal for FTTH since there are many users in a very small space so fiber lengths are short. 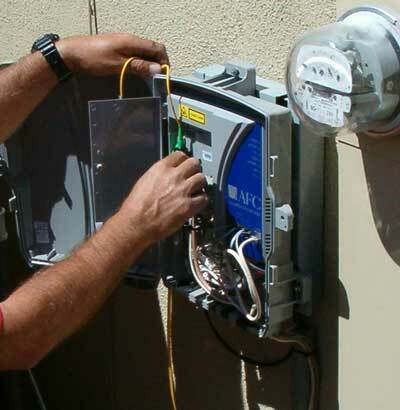 Besides using less fiber, MDUs generally require less time per drop to install. A major problem in older buildings has been finding places to run cables, but new types of bend-insensitive fiber and the special small drop cables shown above make it easy to route fibers along walls or place in stick-on raceways on the walls. 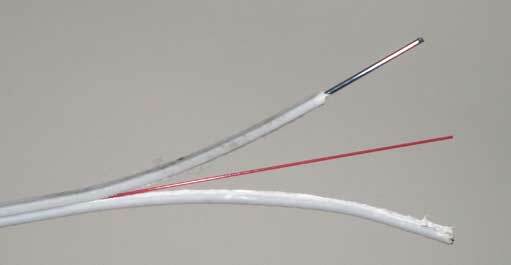 Here is an example from Corning on how bend-insensitive fiber can be treated without problems, but we offer a caution regarding stapling these fibers - it could be a long-term problem and should be avoided in our opinion. 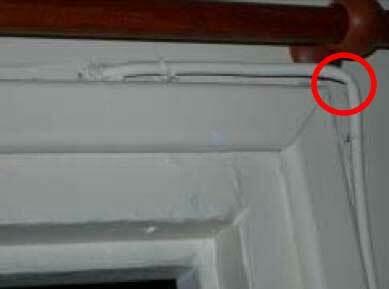 Bend-insensitive fiber installed in older building (Corning). 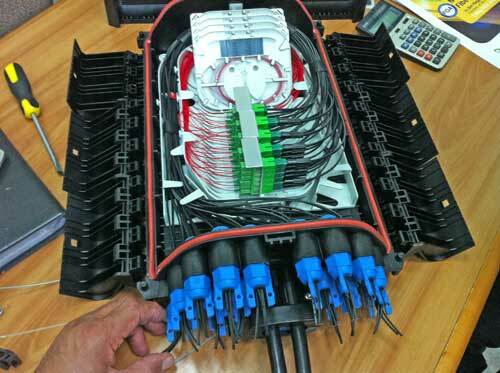 Like most fiber optic networks, every FTTx installation is unique. It must be designed for the location it is to serve and choices on components and installation methods should be optimized for the system. Installation methods may include every type of OSP installation. Suppliers familiar with FTTx can advise customers on what other systems have done to make installations simpler, easier and inexpensive. Most systems prefer to use as many factory-made components as possible as they are generally less expensive than doing the same work in the field. New installation methods should be considered as well to reduce costs. (C)2015, The Fiber Optic Association, Inc.